Today, PA Sea Grant offers adult and K-12 educational programs, funds cutting-edge scientific research, provides valuable Great Lakes and coastal resources and expertise to communities, decision-makers, and individuals throughout the Commonwealth. Our offices and staff are located in Erie, Chester, and Harrisburg, PA - covering Lake Erie, the tidal Delaware River Basin and the Susquehanna River Basin. 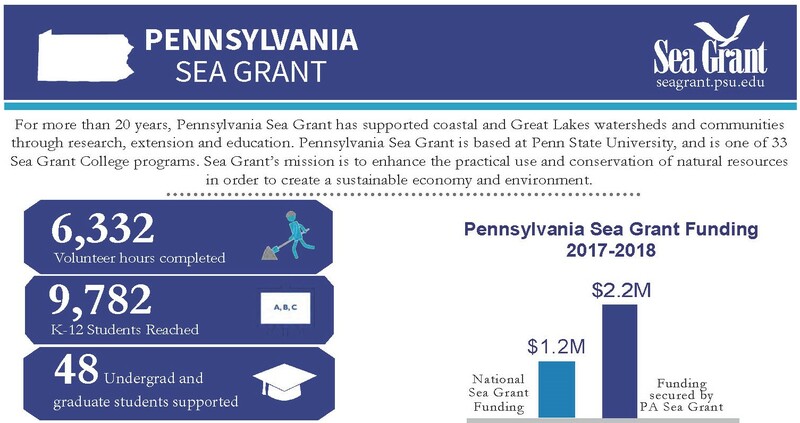 Pennsylvania Sea Grant is one of 33 National Sea Grant College Programs, administered through the National Oceanic and Atmospheric Administration (NOAA). For 50 Years, the National Sea Grant College Program has promoted the ecological and economic sustainability of coastal and Great Lakes resources through the development of science-based research, education, and extension programs. In Pennsylvania, Sea Grant is administered and supported by NOAA, Penn State University, and the Commonwealth of Pennsylvania. Together, the national and state Sea Grant programs enhance the practical use and conservation of coastal, marine and Great Lakes resources in order to create a sustainable economy and environment. Access our past "PA Sea Grant By the Numbers"